Biological tissues and filled elastomers exhibit anisotropic hyperelastic behavior classified by a high stress strain non-linearity and a dependence on the loading direction. Prior to Finite Element Analyses (FEA) the material model needs to be classified and implemented in the numerical framework. 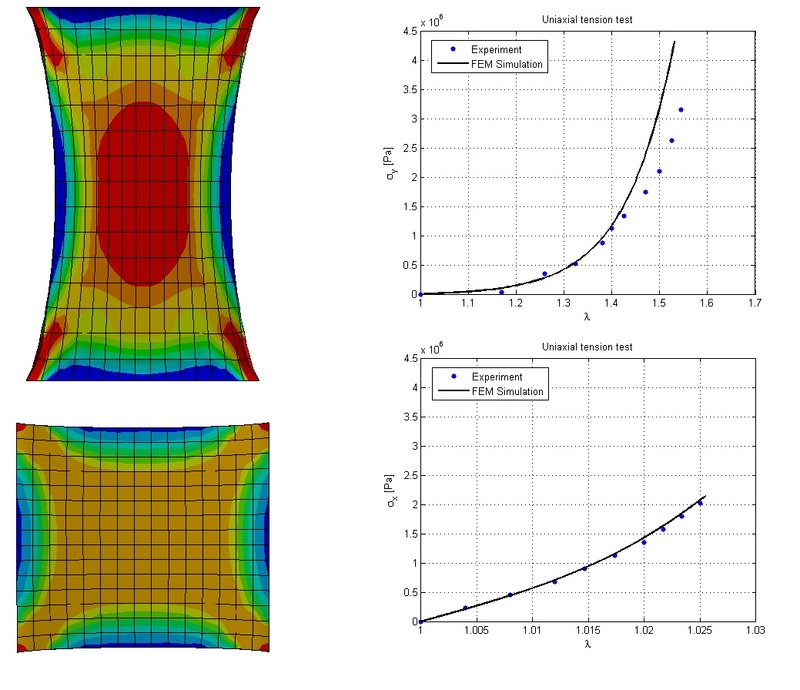 Experimental results from material testing are used for the parameter identification of an anisotropic hyperelastic strain-energy function (Holzapfel model). The material model is implemented in the FEA software with the help of user defined functions. Afterwards the tension tests are repeated in the computational domain and compared to the measured values. The results (figure) show a good accordance between simulation and experiment and proof the feasibility of the material model implementation.